Ganesha Chaturthi is celebrated with full enthusiasm and excitement in our country. People bring the idol of Lord Ganesha to their home and install it with great happiness. People also gather the fund and install the idol and worship it together. In this ten-day festival people worship the idol twice a day and organize several events to celebrate the fest but at last, they immerse the idol in water. Do you also wonder that why immerse our beloved Ganesha’s idol so here we bring the different reason for this ritual. 1. It is believed that Lord Ganesha comes to earth to take the sorrow and pain of the devotees so the immersion of idol symbolizes that dissolving of problems and sorrows of the devotees in heavenly water bodies. 2. Ganesha resides in heaven he comes to earth to hear the prayers of the people. This Act of immersion is seen as a ritual send-off to lord Ganesha for his journey back to his home. 3. It is believed that water bodies like lakes, pond and ocean are the supreme creation of god and it has power to purify the soul, therefore idol is immersed in water to purify them and can enter the heavenly abode. On this occasion, we wish a very happy Ganesh Chaturthi to all may Bappa wish you with health and happiness. Why Ganesh visarjan is performed? 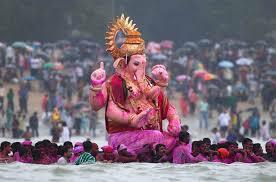 Why Lord Ganesh is immersed in water after Ganesh Utsav? Ganesh immersion, also known as Ganesh Jala nimajjan, is the most beautiful event of this festival. About the immersion reasons and factors, it is the perplexing question to answer. There are some reasons related to both the Sanatana Hindu dharma and the environment. As per many Hindu scriptures, the clay idols of any God (we usually see the idols of Lord Ganesha and Goddess Durga) should be immersed after performing puja and worshipping for certain period. But nowadays the idols of Plaster of Paris are also immersed in water. We should immerse only the clay idols in water and not the idols made of other hazardous material like POP and other harmful chemicals. There is another version of story Ganesh immersion and Durga Visarjan. To reserve fresh water of rainy season in ponds, lakes, tanks, and other water bodies, we need to dig out the old clay or soil in them. To show the accordance between environmental awareness and Hindu rituals, Ganesh idols are prepared with clay of tanks and ponds. But why the clay idols are immersed in the same water from where the artisans picked out the clay? The clay idol is worshipped with turmeric and some other natural herbs during the Ganpati Navratri. The herbal characters of these materials help the water animals like fish, tortoise, etc to grow well. 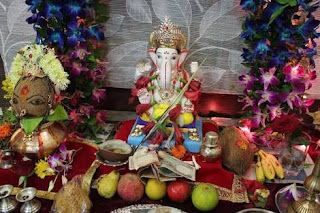 On the first day of Ganesh Utsav festival (Ganesh Chaturthi), Ganesh idol is installed in Mandap or houses. Installation of an idol is nothing but ‘Prana Prathista’ and ‘avahan’ of the particular God in to that. It symbolizes that Lord Ganesh is there in the idol during the festival and receiving our prayers, chants, and nivedanas. Other than her mother ‘Bhu mata’ (Mother Earth – Bhudevi is none other than Goddess Shakti), no one can bear the power and energy of Ganesha after Ganpati Navratri festival and to symbolize his udwasan (farewell) Ganesha idol is immersed in water. Thus, he goes back to his heavenly abode. Ganesh festival is not only a Hindu ritual but also reminds us the protection of environment. As per the scriptures and traditions only clay idols are to be worshipped and immersed in water. Those who celebrate Ganesh festival in eco friendly manner and those who avoid immersion of eco-harmful and eco-hazardous material in water would be blessed with better health and better environment.